And yet the world turned. 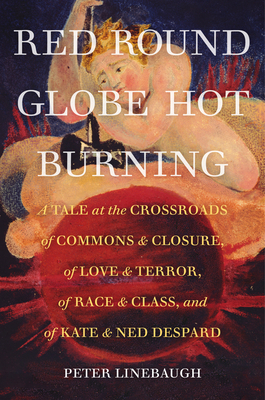 From the connected events of the American, French, Haitian, and failed Irish Revolutions, to the Anthropocene’s birth amidst enclosures, war-making global capitalism, slave labor plantations, and factory machine production, Red Round Globe Hot Burning throws readers into the pivotal moment of the last two millennia. This monumental history, packed with a wealth of detail, presents a comprehensive chronicle of the resistance to the demise of communal regimes. Peter Linebaugh’s extraordinary narrative recovers the death-defying heroism of extended networks of underground resisters fighting against privatization of the commons accomplished by two new political entities, the U.S.A. and the U.K., that we now know would dispossess people around the world through today. Red Round Globe Hot Burning is the culmination of a lifetime of research—encapsulated through an epic tale of love. Peter Linebaugh is a historian and the author of The Magna Carta Manifesto,The Incomplete, True, Authentic, and Wonderful History of May Day, and Stop, Thief!, among many others, and the co-author, with Marcus Rediker, of The Many-Headed Hydra. His articles have appeared in publications that include CounterPunch, the New Left Review, and Radical History Review.